Smith Brothers Donates 21,247 Diapers To Local Shelter. 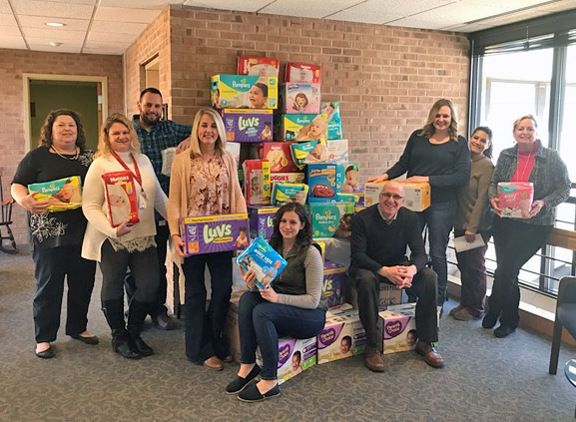 This is the third consecutive year that Glastonbury-based Smith Brothers Insurance participated in the Professional Liability Underwriting Society (PLUS) Foundation Hartford Chapter’s annual Diaper Drive for My Sisters Place. This year, employees at Smith Brothers exceeded their goal and set a new record by donating 21,247 diapers. Supporting the Diaper Drive is part of Smith Brothers’ ongoing “Helping Others” philosophy, a dedicated commitment to continually giving back to the community and helping those in need. For 2017, employees of Smith Brothers agreed to focus on charities that help children. Since 1982, Hartford-based My Sisters Place has created a safe and nurturing shelter for homeless families, and easily goes through 6,000 diapers per month. Smith Brothers is one of the largest independently operated insurance and financial service organizations in New England. Their offices are in Glastonbury, Chester, Niantic, Somers, and Windsor Locks, Connecticut, as well as Easthampton, Massachusetts.